The white arms outstretched are the sweet smelling Spirea (unidentified as yet). I also included several different tulips, including a flashy new parrot tulip that opened this week, helpfully labelled “Parrot Tulip”. Then some Cowslips and Dandelions, Lamium and Kerria japonica. There’s a big Hellebore leaf in there along with a couple of the large Trachystemon orientalis leaves and a whisp of Fennel. Oh, and a new Narcissus which I think is called “Cheerfulness”. Here’s a big hug from my Spirea for you all. (See that blue sky?)! Your in a vase Monday always brightens my day! The tulips are marvelous! 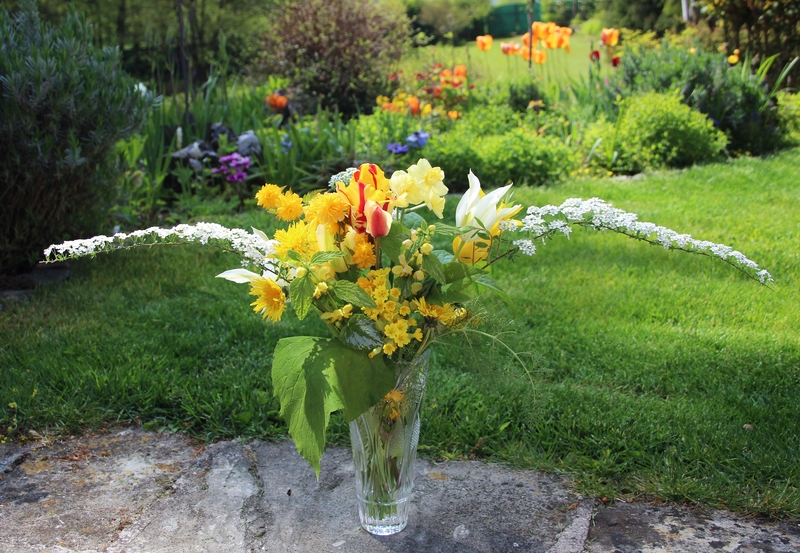 Cathy I love all those yummy yellows and the white arms of spirea….a perfect vase to showcase on a warm, sunny day! What lovely colours in your vase Cathy. I love it, so sunny and warm. Your spirea looks like Spirea arguta ‘ Bridal Wreath’. Thanks Chloris. Bridal Wreath is certainly a fitting name! We have had more of that blue sky all week Cathy. Hope you have had warmer weather too! Gorgeous. The parrot tulip is a beauty and your vase says Spring! It really is spring now. In fact it was so warm yesterday that spring almost became summer! Love the arrangement, especially the Spiraea, it looks like cantonensis ‘flora pleno’ to me. Reeves Spirea, anyway?! Thanks for the suggestion. I think it is probably Bridal Wreath, which Chloris suggested, and it is the most common one found around here I think. A shame the dandelions only last a day. Still, I have plenty of them! How beautiful Cathy! Your vase of flowers with the border in bloom in the background looks like happy garden times to me. Glad the weather is sunny and warm. Enjoy. Oh I am enjoying it Susie. And having a well-earned rest today after sowing all my seeds at last! That’s such a bright and cheery vase Cathy which looks as if it might well take off 🙂 It made me smile to see that you had picked some of the dreaded lamium. Hope that you have a good week. Big hugs back to you and your cheerful vase. I love that tulip in name and color. It’s brilliant. Thanks Alys! The parrot tulips are something special! wow – this is such beautiful vase and colors.. I love a vase that hugs! This is so brilliantly colored – love the tulips, the parrot tulip especially. 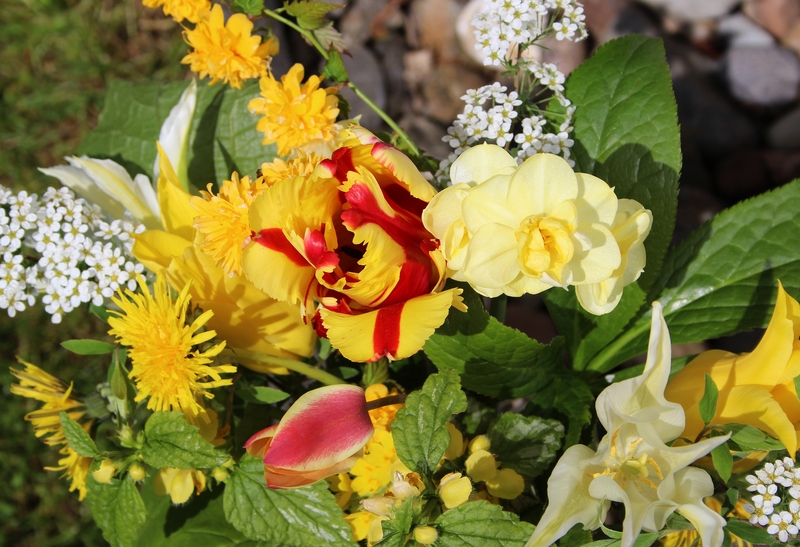 🙂 The tulips in the garden are wilting in our gorgeous warm sunshine, so I am glad I could bring a few indoors to enjoy. Is the Parrot Tulip the multi-colored one – bright yellow and red “stripes”? If so, that fits, and I like it! Wow, that’s beautiful! Love the colors and variety and the setting in your first photo is perfect. Glad to see spring back and going strong! A happy vase of lovely spring flowers AND a blue sky, what more could anyone want! Our sky wasn’t blue all day yesterday, very unusual. The rain was good but it is still so cold here. the Narcissus looks like ‘Cheerfulness’ to me; very apt in this cheery vase. I think I saw this Narcissus on your blog last year. I do love it! Seeing something on a blog is a great way of finding new plants or varieties that you like. Thank you Annette, yes the Spiraea sprigs are more like wings than arms! I hope you have such wonderful spring sunshine this week too. Such a lovely sunny vase of golds with white and green to balance it out. Quite the thing to dispel the winter blues. Glad to hear you have warm weather. Here it is the first noticeably warmer day this year or so it feels! Love the imagery of a big hug from your vase Cathy, love the glimpse into your colourful borders in the background too. Happy Spring, Cathy 🙂 Love that “Parrot Tulip” lol! I see two possible IDs already for your spiraea, so I’ll add a third: S. x vanhouttei, another “Bridal Wreath” type. Anyway, what a delicious combination of spring colours! Thanks Amy. After looking at so many pictures of Spirea and making my head spin, I shall settle for calling it Bridal Wreath! Spirea looks like 2 wings, lovely! Love the Spirea wings. Happy Spring! And a very happy Spring to you too Jason! 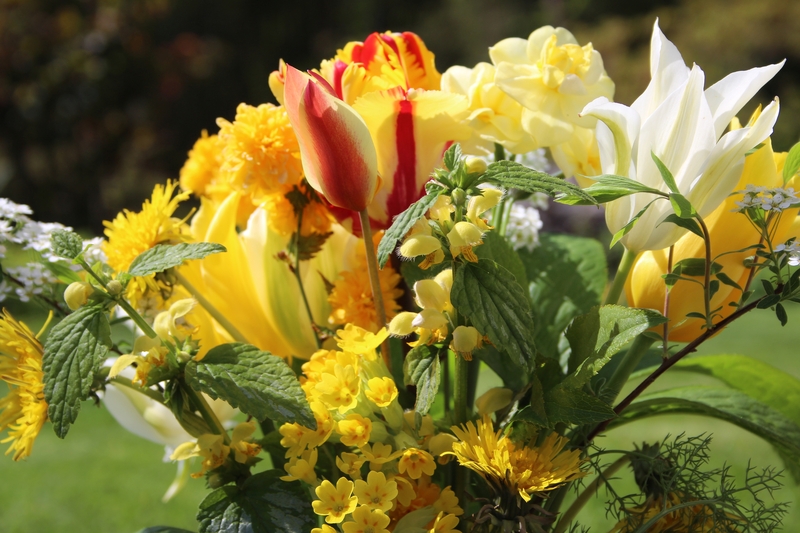 A real bunch of spring – thanks! Thank you for visiting Cathy! I had to include that blue sky on our first really warm day. 😉 And now we have had a whole week of this lovely sunshine I feel quite lucky! A cheerful vase as always Cathy. The Spirea looks simular to the one in our garden, Spirea ‘Arguta’ Bridal Wreath. What a gorgeous tulip with the red stripes, it really steals the show, Cathy! The froth of different yellows are so cheerful, like sunshine. Spirea is one of my favorite shrubs, but I don’t have the white “Bridal Wreath” type, yours makes such a long fabulous arc, very welcoming. Your lovely vase of flowers does seem like a warm hug. Hope the coming week is just as nice as your previous one was.